Bavaria is a great destination for a holiday with a baby or toddler. Less than a 2 hour flight from most UK airports with loads of things to do in the local area means you will have a great family holiday here. We visited Bavarian Forest Holidays in July 2013 with our 3 year old toddler and 5 month old baby – read on to find out how we got on. Bavarian Forest Holidays offers a variety of 5* baby friendly apartments in the heart of the Bavarian Forest in Germany. Halfway between Munich and Prague, they offer high quality, spacious apartments in the pretty mountain village of Bayerisch Eisenstein. Facilities such as an onsite shop selling most of the things you will need at very reasonable prices, a library and free WIFI help to make your stay as relaxing as possible. 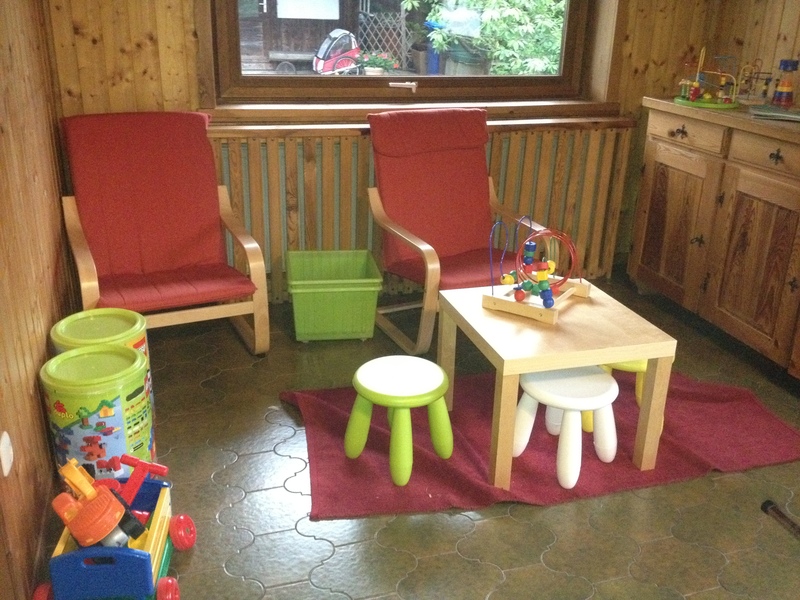 Bavarian Forest Holidays focus on providing baby friendly holidays and offers more than 20 different items of baby equipment to borrow free of charge for the duration of your stay. There is also an indoor and outdoor play areas and a pre arrival shopping service meaning your nappies, baby milk etc are waiting for you upon arrival. Throw in a plethora of activities and things to do in the local area for babies, toddlers and parents means you really will have a memorable family holiday. What will babies and toddlers love about holidays at Bavarian Forest Holidays? From the moment you arrive, your little one will love staying here. Our 3 year old was so excited to find his own Bavarian Forest Holidays teddy bear on his bed when he arrived. The excitement continued when he discovered the toys in the Games Room opposite our apartment and the children’s DVDs in the library. There is an outdoor play area with swings and a little slide, and the Bavarian Forest is just at the end of the road which he loved exploring. Germany is a very child friendly country and everywhere we went had a well maintained playground available for little ones to play on. The public transport is clean, efficient and free for people staying in selected villages in the Bavarian Forest. Our 3 year old is a bit of a train and bus fan so loved getting about on public transport. Our 5 month old baby loved the baby bouncer that we borrowed for our stay, and the baby toys for him to play with. All the equipment was spotlessly clean and looked like it hadn’t been used before. 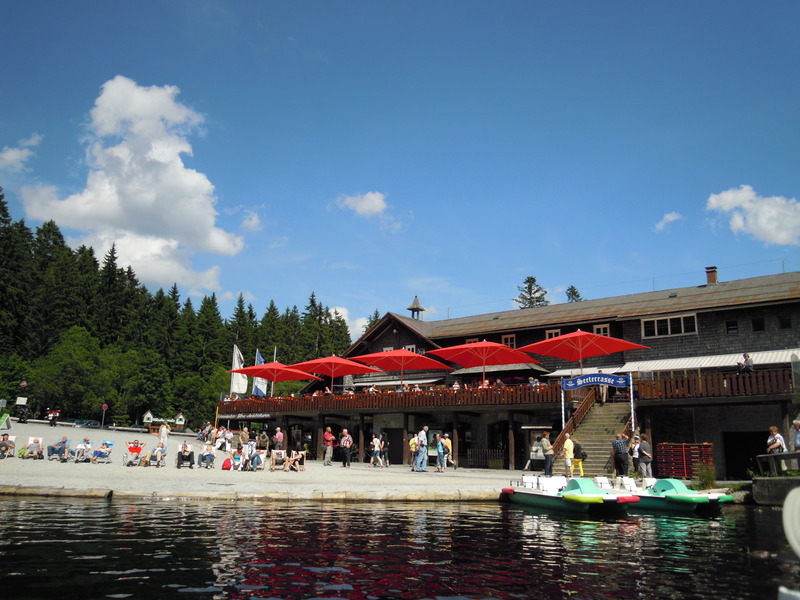 Why will parents love holidays at Bavarian Forest Holidays? My husband likes to think he is a bit of a coffee connoisseur and was over the moon when he discovered a coffee grinder and coffee beans in our apartment. He also loves trying new beers and was really impressed with the range of German and Czech beers that were available in the onsite shop at a very reasonable 1 Euro a bottle. I was really impressed with the range of baby equipment which was available for us to borrow meaning I had to pack and carry less. 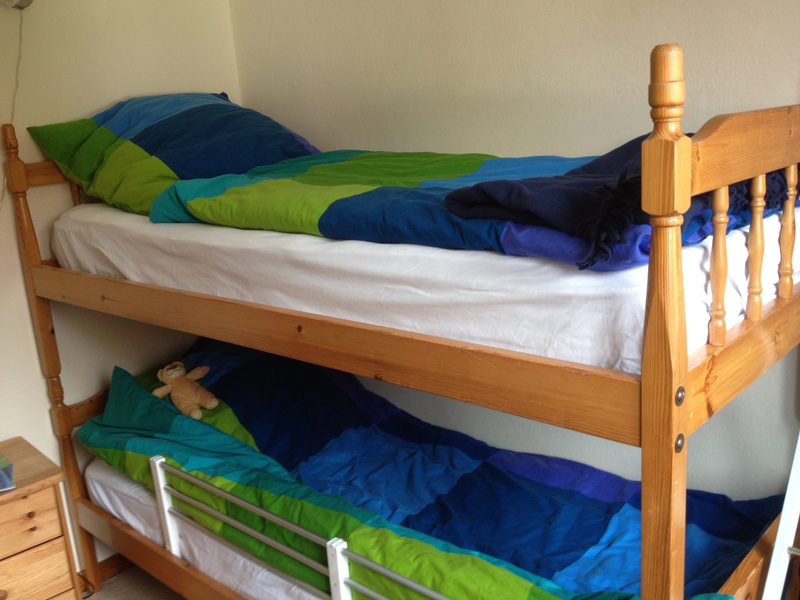 The wooden cot (I’m not a fan of travel cots) was comfortable and meant our baby slept really well when we were there. All the equipment we borrowed was clean, well maintained and set up ready for when we arrived. I had also pre ordered some full fat milk for our 3 year old and that was in the fridge when we arrived too. There was a wealth of information about things to do in the local area including buggy friendly walks, walking tours of popular cities such as Prague, walks where you can stop for lunch along with restaurant menus for local eateries. All this information meant we made the most of our time spent in Bavaria. The TV in our apartment just had German TV on it but there are over 500 DVDs available to borrow from Reception whilst you are there. There are leisure facilities such as a sauna and gym onsite but we didn’t use them. 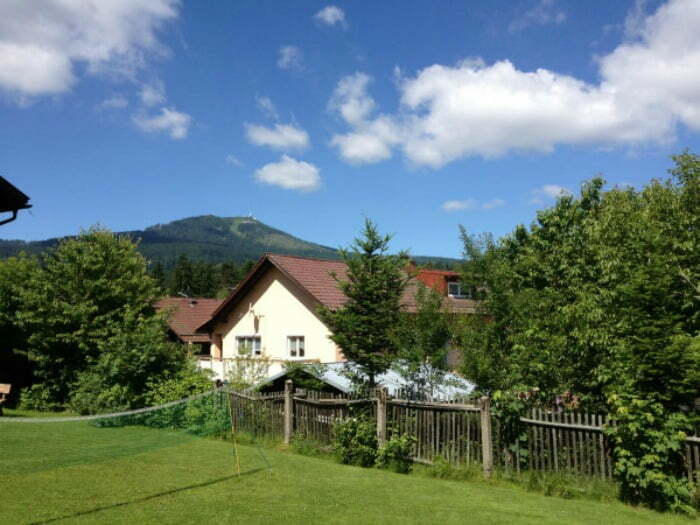 If you like to spend your family holidays being active and outdoors and want to stay in high quality accommodation whilst you are there, I would definitely recommend Bavarian Forest Holidays for your next holiday with your baby or toddler. What will babies and toddlers love doing in the local area? There is so much for babies and toddlers to do in the local area. We stayed for 8 days and still didn’t manage to do and see everything. Our 3 year old toddler loved cycling in the forest. 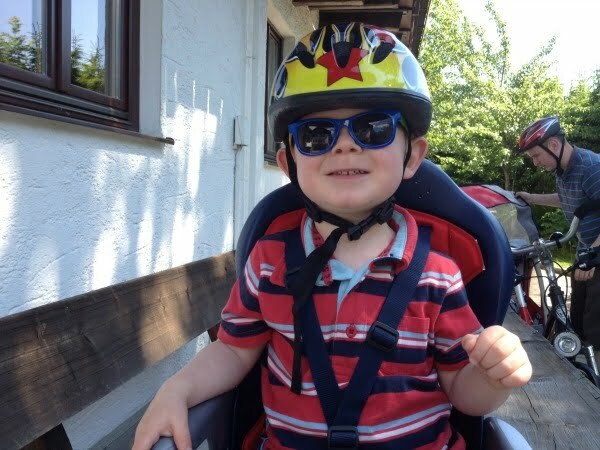 We hired bikes with a baby seat for the 3 year old to sit in and a tag along for the baby to ride in from Bavarian Forest Holidays, and spent a day riding in the forest. In Reception there is a lever arch file full of buggy friendly walks along the cycle paths in the Forest, so we went along one of the cycle paths in the Forest to a Woodcutters Cottage. We had a lovely lunch overlooking a picturesque lake and then our toddler played in the playground and saw the animals which lived there. Other highlights included our children’s first time on a cable car. Toddlers will love getting the cable car up to the top of the Arber Mountain and having an ice cream at the top. Swimming at the Osserbad leisure complex at Lam was a bit hit with our 3 year old. The weather was really warm and sunny when we were there, and the Osserbad complex has 4 indoor swimming pools and 3 outdoor pools. We arrived at 11am and finally managed to drag the 3 year old out of the pool at 4.30pm after a fantastic day. He loved all the different pools and there was a small baby pool as well which was nice and quiet for our baby. There was a couple of little waterslides as well as a poolside cafe serving nice refreshments throughout the day. A day pass for 2 adults and 2 children only cost 16 Euros for the whole day. First time mum and want to take our six month old away – nervous about it but love to travel and want to take the plunge. I do appreciate all the small details that only another Mum would think to include. Thank you so much.